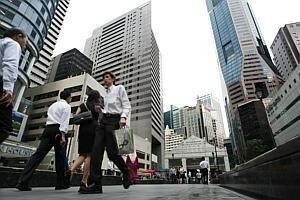 LABOUR productivity continued to contract in the first quarter of this year, sliding 2.2 per cent. This is the second worst quarterly showing in almost three years, and continues a contraction which began in the last quarter of last year, when labour productivity fell 0.5 per cent. Productivity dipped in both the manufacturing and services sectors. Together, they employ nearly nine in 10 workers in the labour force. The numbers may seem dire in the light of the country's recent push for higher productivity, but economists said the poor performance was more likely simply the result of economic output falling in the last quarter. The current method of measuring labour productivity is to divide the country's GDP by the total number of workers. Singapore Management University economics professor Hoon Hian Teck felt the dip in productivity could be because companies are still holding on to their workers even though sales have fallen. The companies are avoiding retrenchments in case slower sales is temporary, he said. UniSIM Associate Professor Randolph Tan said the decline is a temporary blip arising from current changes in the labour market, with the Government tightening the influx of foreign workers while trying to boost the productivity of local workers. 'There is no reason for the poor performance to persist in the long term, once the labour market situation - specifically relating to foreign manpower numbers - stabilises in the longer term,' said the professor. But others were not so sanguine. 'This clearly means that we must really step up the productivity drive so that workers can get higher and sustainable pay rises through productivity gains,' said DBS economist Irvin Seah. While it is all right for the Government to set productivity targets and measure them, it is more important for productivity improvements to translate to sustainable income increases for workers, he said. So, he is more concerned about another finding in the Ministry of Manpower's latest report - that the real average earnings of workers fell by 3.9 per cent in March, after inflation eroded the meagre 0.9 per cent increase in average monthly wages. Inflation soared to 5.4 per cent in April, due to higher car prices and accommodation costs. MP for Bishan-Toa Payoh GRC Zainudin Nordin agreed. 'The slip in labour productivity is a wake-up call that our drive to boost workers' pay through higher productivity is not going to be easy,' said the chairman of the Government Parliamentary Committee for Manpower. The only sector that bucked the overall trend was the construction sector, which saw an increase of 1.2 per cent in labour productivity in March. The increase did not surprise Dr Ho Nyok Yong, president of the Singapore Contractors Association. 'We were expecting the increase because in the past few years, our members have been working on their productivity,' he said. This year, the association and the Building and Construction Authority started running productivity clinics for smaller contractors, where they sit down with individual members and talk them through the challenges they face in raising productivity.